so MUCH for getting this to work Charis!!!!! So many hugs to you, your such a wonderful person! I hope everyone enjoys it as much as I did making it! It was fun... I shed a few tears too. :( .. but It is a message that hits home! I've only met one King in person, at the open day of my nearest bird/wildlife hospital. He was awaiting collection by an adopter that day, having been found wandering around somewhere out in the sticks, with no clue how he came to be there. Of course, it would have been totally impractical to adopt one myself, in my apartment, but he was such a beautiful bird, and I think pretty uncommon among pigeon-keepers in the UK. I'm thrilled that your video has been posted here ( Charis). For some reason I couldn't open it from my email. It's absolutely spectacular. Everything about is it top notch. Pij-n-Angels is a perfect example of networking at it's finest. 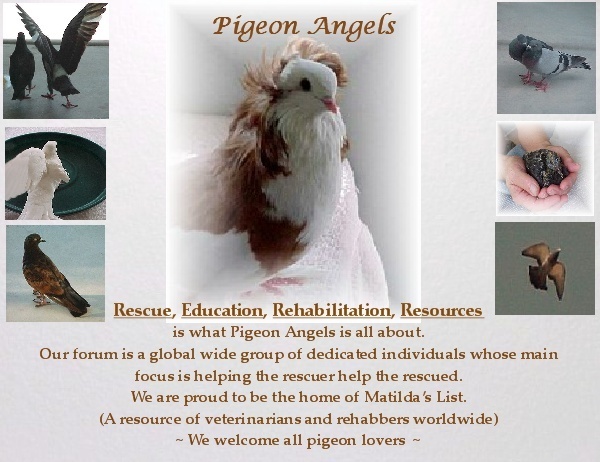 Thank you all for everything you have done, and continue to do, to help our fine feathered friends. I cried when I first saw it. Thank You all for such KIND words!.. :sunny: I AM SO happy that you all liked it, and took the time to watch it~ Thank YOU! Pigeons have a way of inching, right into your life. They hold a special place in my heart! This video was beautiful. It put tears in my eyes. It is obvious that a lot of time and thought went into making it. Thank you so much for sharing it with us. Pigeons have a way of inching, right into your life. They hold a special place in my heart! Each one of my birds has built a special nest and placed deep in my heart. They are continually filling them with treasured memories. Whitefeather and Pij's nests are now full and I love that I can visit them often. Thanks to all who rescue, rehab, and/or who give temporary or forever homes to our feathered (& 4-footed) friends! Some of life is, indeed, very harsh - - - but THIS is the more gentle side - - - that which makes the rest just a bit more tolerable!! Thank you WW for doing your part too. Doesn't need to be a King. I know you have offered your home to Pigeons that need a place to molt their feathers and incubate wooden eggs. And we are that you are part of it.